Posted in: Monthly Updates, Weekly Post. Tagged: acorns, batman, house, house savings, prosper, savings. Holy wife getting paid a crap ton Batman! 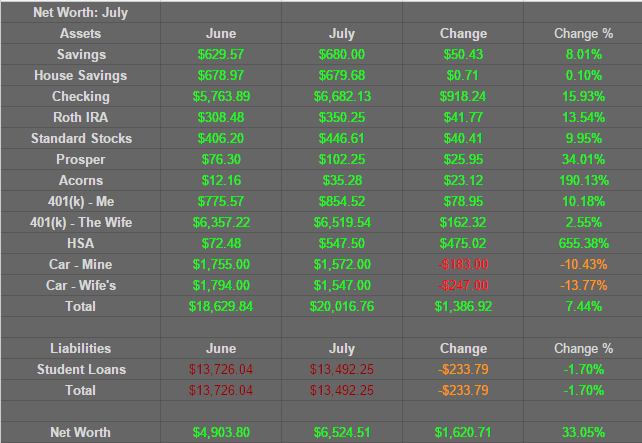 So now that my wife is making almost as much me, we have a lot of money rolling in each month. Right now it is both good and sucky since that extra money is going to pay off medical bills (ALL THE BILLS!). Even though we have increased our income, we have decided to cut back on things. We are currently trying to live on just my paycheck. The plan after this month, is to have all her income go toward house saving/OMG-WHERE-DID-THIS-EXPENSE-COME-FROM?!?!!?. As long we do not have the latter, this means we should be able to put 3k in savings for a house each month! That is not a small number! We might be buying a house next year with a very nice down payment! Savings: Not much increase here, we are going to putting away $50 a month to build it back up. House Saving: Nothing this month. Boo medical bills. Prosper: Prosper has a rating system for how risky loans are (AA, A, B, C, D, E, HR(High Risk)). Right now I have 3 D loans and 1 AA. I think I am going to try and keep this 3 to 1 ratio so I don’t lose too much by going all in with the higher risk loans. Right now, everyone is paying back on time. Acorns: Not too bad. $20 bucksish a month of change going into an investment account. To date I’ve lost $.18 thanks to the stock market tanking lately. The rest is business as usual. How did you guy do?